Polychlorinated biphenyl (PCB), a dangerous chemical, was illegally dumped along North Carolina highways in 1978. When the dumping came to light, state officials selected the mostly Black community of Afton, Warren County, for a landfill to store the contaminated soil. This site did not meet EPA guidelines for hazardous waste landfills. Residents fought the landfill’s construction through legal action and protests. More than twenty years later, community members held the State to its promise to decontaminate the site. 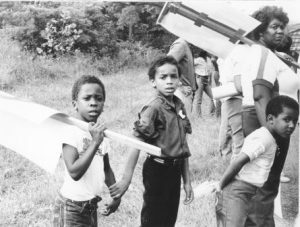 The situation in Warren County sparked a national landmark study of hazardous waste landfill siting in poor communities of color and is recognized as the birthplace of the environmental justice movement. “If you’re not responsible to Mother Earth, most likely you’re not going to be responsible to the children of Mother Earth. . . .